If improvements should be achived by an automation of the inspection process this requires a control of the process parameters of the whole equipment by an "intelligent" system and not by displays still being controlled by the human inspector. To operate the MPI and LPI eqiupment at stable und reproducable inspection conditions modern units are equipped with a monitoring and control system called "Quality Assurance Package"(termed QAP). The QAP System is based on an industrial PC with a bus system and field sensors. 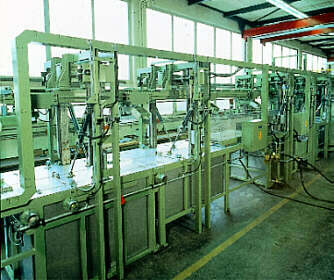 It ensures that process parameters important for the reproducability of the MPI or LPI are controlled an held between defined limits by a central computer system. It can be adapted to any old systems, as well as integrated into new systems. The QAP is the basic system required to install a fully automated inspection by a camera system and image processing. The camera system consist of CCD-cameras and a pattern recognition software. The normal time to take a picture of the part is 40ms and the whole crack detection is finished typcally after 200ms, the maximum processing time is about 600ms for each picture. The camera system itself has to be monitoring which is given by an artificial crack always being processed together with every inspected part. Additionally the distance between the camera and inspection-surface has to be controlled. The software for flaw detection was developped in a way that enables the camera of measuring different areas of the parts with different sensitivities in a single step and to cover areas that not have to be inspected. Concentration, for instance one supplier of conrods for even competing automotive car producer as well as the change from ferritic materials to aluminium and or magnesium leads to high production and inspection rates and to some extent to change from magnetic particle inspection to dye-penetrant inspection. Dye-penetrant inspection and magnetic particle inspection are still the most sensitive surface inspection methods available and there is a need to have fully automatic inspection with good reproducibility of the inspection, calibrated, with on-line documentation and low cost for these inspection methods. The paper describes an existing solution for on-line, operator independent inspection at almost the costs of statistical non destructive testing. In automotive part production, aluminium as well as magnesium is mostly done today by dye-casting production at a production speed of up to one to two pieces in 10 seconds. After leaving the press, the parts are handled by hand and, or more common, by roboters for cleaning, grinding and other mechanical treatments and then they are inspected within a more or less automated dye-penetrant equipment including visual inspection by human eyes. Due to very well controlled dye-casting surface flaws or curls most at the time only occur in certain areas. The inspection might be done by looking most intensively only to this certain surface areas. 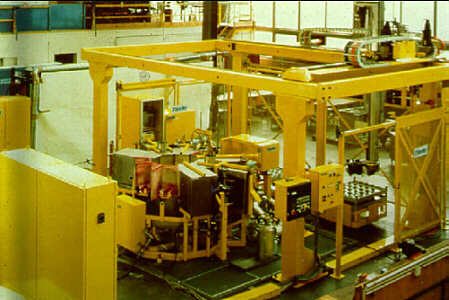 Tiede has delivered many of such systems, either with tanks for dipping of the parts or spraying the parts according to API and DIN as shown in figure 1 and 2. These systems habe the disadvantage, that the propability to find flaws due to the human envolvement is only 60 to 75 % and due to labour costs is very expensive. Several efforts habe been made to get dye-penetrant inspection similar to U.T. or E.C. inspection for the reproducibility and flaw detectability, on-line equipment status documentation and on-line test results status documentation, but still for the most sensitive surface crack inspection even at difficult access surface areas. The replacement of the human inspector by cameras, without automated self monitoring, the non-existing monitoring and control of the UV-light intensity, by non-automatic liquids quality inspection variation of distance between movable parts and camera focus line and all the others variable inspection parameters. To replace the inspector by cameras, one has to guarantee conditions, that cameras, nowadays very stable CCD cameras, can operate as stable as necessary, that means any condition at the focus distance has to be monitored and controlled and the camera has to have a self-check, everything simular to the integral system check as used with Tiede M.P.I systems. Tiede has solved these automation problems by introducing a quality assurance package (QAP) and a multiple camera system self monitored, called Opto-tec. The Quality Assurance Package, QAP, monitores the system parameters as well as the operating conditions fully automatically. The Quality Assurance Package is based on an industrial PC, can be added to any old system as well as being integrated to new systems. It monitores and controls the following parameters. To allow the CCD camera to operate in constant reproducible conditions the UV-light intensity at the focus distance has to compensate the aging of the UV bulbs. Figure 4 shows the time behaviour of the UV-light intensity in a standard non controlled system. Tiede uses self-powered UV-sensitive diodes to control the UV intensity. Within a computer controlled by-pass to the penetrant liquid flow Tiede measures in customer selected intervals the consistence, possible dirt impacts in case of reused liquids, temperature and any other parameters water conditions, especially in Europe, liquid level in tanks, on-line. This is the equal system, used as "automatic ASTN-bulb" fo Magnetic Particle Inspection measuring dirt impact as well as particle concentration by measuring the reflected UV-light is shown in figure 5. For spraying systems the function for instance the pressure drop at every single nozzle is monitored to insure equal wetting of the surface to be inspected. Time control is done to meet required API and/ on DIN regulation by monitoring and controlling the transport speed as well as the duration of exaltation. Time control is also used to allow the flaw indication propagation examination during and after penetration to allow a better discrimination between flaws and their accuracy against background indications, not so easy to discriminate after a fixed inspection time of about 3 or 4 minutes. This time control is made by placing cameras to the required surface area along the conveyor equipment and which is "impossible" to do by human inspectors. To allow reproducible inspection one has to control the distance, camera focus line to inspected part surface monitor and control the camera to guarantee the camera operation reproucibility within the focus line distance. For systems with up to 18 cameras to inspect the whole surface area at a part production time of 10 sec. it is necessary to monitor any objectiv set-up like instantaneous shutter and so on due to accidental changing camera adjustments for instance by checking the system in fully automated systems with automatic change from one part geometry to another with reuse of stored set up adjustments and the objective values as well as distance are controlled automatic (optional, only if in use with Opto-tec). For all these above mentioned variable parameters and on-line operator independent inspection a protocol of the status is printed out to be used as documentation for the inspection. The Quality Assurance Package contains also operator identification, inspection statistic of the different parts, a "unicode" function allowing automatic system set up for already inspected and stored parts and so on. Any quality deviation of the part to be inspected and of the system is printed out. Fig 6 After login, the plant overview is displayed on the screen. This shows the name of the tester,the penetrating plant with the different cabins, the tabs for selection of the individual cabins,the time passed in the respective cabins, the order data,release of the specified order, waiting operating and fault messages,input options for test results. Fig 7 A separate screen is available for each cabin. It contains the name of the cabin , a symbolic display of the cabin including the different sensors, if available, the workpieces in the cabin, the status of the sensors, (mark = sensor active) the names of the sensors and their current measured values, status messages for service purposes. The Quality Assurance Package allows a fully automatic operator independent inspection and documentation. A typical print out of a QAP in use for inspection of Boeing wings is shown in figure 6 and 7. The Opto-tec system consists of CCD cameras and a pattern recognition software. In multiples of four and one PC, or one camera with one PC, depending on inspection speed, every taken picture can be processed and evaluated within approximately 150 msec. The software allows any flaw recognition with equal sensitivity in 360 degree at the surface, minimum flaw detectability from 10 to 5 mm length or single dot, 1 mm, recognition. It is possible to measure with one camera within one picture with two sensitivity levels to allow easy discrimination against different background levels. For moving parts we use strobed UV-bulbs very sufficiently. It is possible with the Opto-tec system to generate any kind of geometry within the window screen to reject required areas as holder shades or whatever is necessary. We also use this window technique to monitor a test flaw within the window, cross with symmetric geometry and measure/calculate the flaw geometry appearance. Any deviation from the original stored measured crosses the system to stop and we therefor have a self monitored camera system, in use at every picture taken by the cameras. Figure 6 shows a typical test flaw within an inspection picture taken by the cameras. Together with the operator independent system monitoring and documentation done by the Quality Assurance Package and with the camera self-monitoring test flaws, we have an integral system measurement to allow fully automatic reproducible, calibrated dye-penetrant inspection. The philosophy of this development was to supply a system automation which allows any available dye-penetrant from almost any suppliers of consumables to be used. There is no discussion about the best consumables supplier, any customer can choose and use his over years achieved experience. This idea has been proven as very successful already with the identical development from M.P.I..
a non automatic system is about DM 0,60, German labour costs. With an automatic system, for instance turnable, but not Opto-tec DM 0,50, German labour costs. With Quality Assurance Package and Opto-tec it is about DM 0,07, including depreciation of investment, calculated for 3 years, two shifts. This results only in saving the inspectors labour costs. Tiede guarantees a flaw detection probability of about 95% and an operator independent system condition document to fulfill customer requirements and, as state of the art inspection to be prepared some liability questions. Figure 6 shows a system which was in use for Optotec for many years with no problems. With the existing Quality Assurance Package and the pattern recognition system Opto-tec one can have an on-line operator independent dye-penetrant inspection at high inspection speed with a calibrated bill sensitivity and a flaw detectability of better than 90%. Due to any kind of documentation can be provided, even mapping of flaws at large equipment. Discrimination with different flaws and, if necessary a marking/sorting of inspected parts. With such systems it is much easier to meet the ideas of ISO 9000 and doing inspection according to the state of the art to argue in liability questions.